St Kilda is an inner suburb (neighbourhood) of the metropolitan area of Melbourne, Victoria, Australia, 6 km south-east of Melbourne's Central Business District. On the 14th (Sun), tour the pleasant surroundings at Windsor Siding and then take in the waterfront at St Kilda Pier. 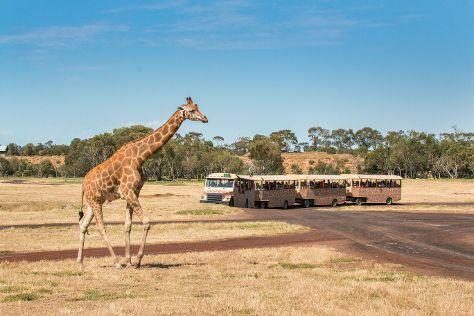 Here are some ideas for day two: examine the collection at Scienceworks, admire nature's wide array of creatures at Werribee Open Range Zoo, and then admire the natural beauty at Veg Out Community Gardens St Kilda. To find reviews, maps, other places to visit, and tourist information, read our St Kilda road trip site . Auckland, New Zealand to St Kilda is an approximately 8.5-hour flight. You can also drive. The time zone difference moving from New Zealand Standard Time to Australian Eastern Standard Time (Victoria) is minus 2 hours. Traveling from Auckland in April, St Kilda is little chillier at night with lows of 12°C. Wrap up your sightseeing by early afternoon on the 16th (Tue) to allow time for travel back home.